First of all, apologies again for an extended break from posting. I’ve been busy trying to get myself a “real” job and hence the delay. Unfortunately, for some of us, nature photography can only be a part time hobby and doesn’t help pay the bills. Anyway, it was one evening as I took a walk to my local stream that I spotted this bird. 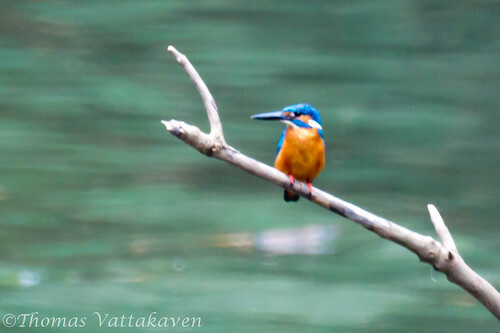 It is the Common Kingfisher (Alcedo atthis), also known in some parts as the Eurasian Kingfisher or the River Kingfisher. The word “common” in it’s name is a bit of a misnomer as it is not all that common around these parts of Kerala. 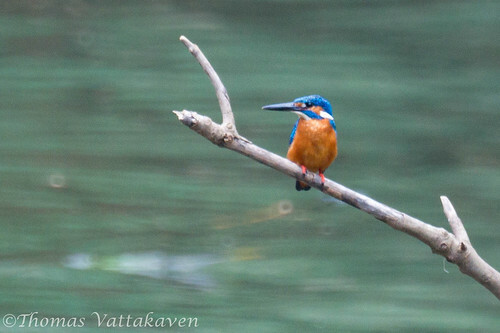 This is the first time I have spotted this kingfisher in this area. 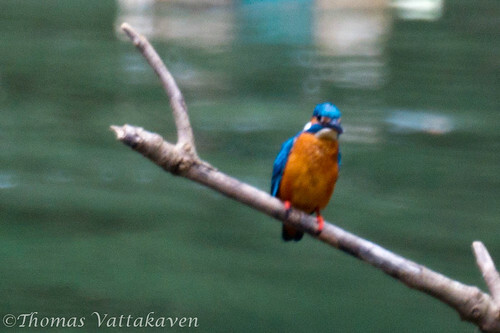 In fact, it is the White-breasted Kingfisher, which is the most common kingfisher in these parts. 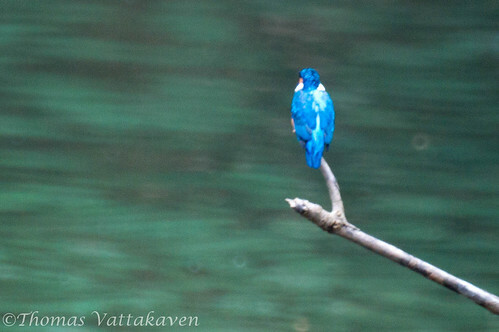 This species is a very tiny bird but it’s bright colouration is hard to miss. It has a short tail and a large head with a long bill. 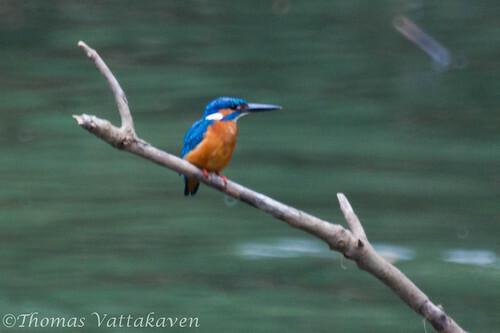 The upper parts are blue while the under parts are orange and has a white neck blaze. Male and female are identical except for the orange-red present on the lower beak of the females. It is one of the most photogenic of birds but using my f8 fixed aperture lens in the low evening light obviously hasn’t done justice to the spectacular beauty of this bird. 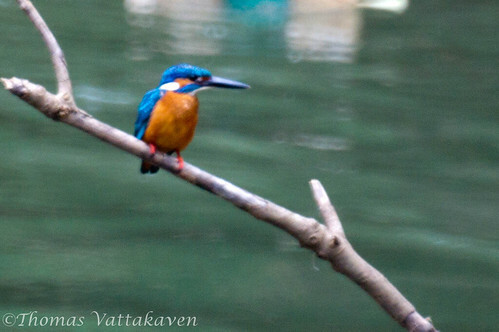 The Common Kingfisher is a good indicator of freshwater quality. It needs clear water too be able to see it’s prey and hunt by diving in and catching it. This is probably the reason, why it is not so common any more! They are highly territorial and require long stretches of river, where they can be seen flying low over the water surface with an accompanying whirring sound caused by it’s wings. It has no song but it’s flight call is a chee sounding sharp whistle repeated 2-3 times. They are also known to emit a harsh shrit-it-it sound when anxious.